Tumor cells, which would typically be recognized by T cells as foreign, have established ways to evade the immune system. This forms the central strategy in targeting immune checkpoint modulators in immunotherapy: overcoming one of cancer’s primary and powerful defenses. Antibodies that block these immune modulatory proteins can either stimulate or inhibit the T cell functions. While we often group anti-CTLA-4 and anti-PD-L1/PD-1 therapy together, fundamental differences exist between these two treatments. Distinctions in mechanism of action, clinical efficacy, toxicities and potential biomarkers for predicting response may have important implications in shaping future development of cancer treatments. Here is a closer look at what is similar and what may be unique between the two immunotherapies that have helped transform and revitalize immuno-oncology. At the very start of the process is identification and binding of a T cell receptor to an antigen found on the MHC (major histocompatibility complex) of an antigen presenting cell (APC). However, T-cell activation is complicated and multiple other factors, such as additional or secondary signals, influence pathway activation. CTLA-4 Mechanism of Action, from E. Buchbinder and A. Anupam 2016. In the CTLA-4 pathway, CTLA-4 on the T cells bind to the B7 molecule on the antigen presenting cell (APC), while CD28 competes for binding to B7 on the APC as well. The amount of CTLA-4:B7 binding compared to CD28:B7 binding determines whether a T cells will be unresponsive or activated. Thus, increased CTLA-4 binding to B7 is an inhibitory signal and limits interleukin-2 (IL-2) production, and therefore also limits the proliferation and survival of T cells. So, CTLA-4 antibodies work to basically turn off this inhibitory mechanism or “release the brakes” to allow the cytotoxic T cells to work. PD-1 Mechanism of Action, from E. Buchbinder and A. Anupam 2016. Like CTLA-4, PD-1 binding to PD-L1 (and PD-L2) inhibits T cell proliferation and activation, and interferon-gamma. While both are negative signals for T cell activation, the locations and timing of these events is different. 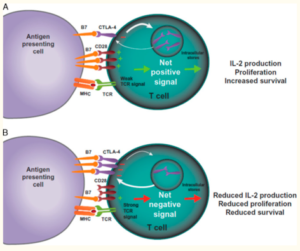 CTLA-4 is expressed on the T cells, while PD-1 is expressed more generally. Normally, CTLA-4 inhibits T cells in the early stages of the immunity cycle in the lymph nodes, while PD-1 regulates in the immune response in the peripheral tissues or at the tumor site. Adverse Events Reported by Pateints Treated with Checkpoint Inhibitors. Callahan and Wolchok 2013. While both therapies have reported adverse events, there are some reports showing a higher incidence and grade of AEs with anti-CTLA-4 treatment (Callahan and Wolchok 2013) Results from a phase III advanced melanoma trial showed a rate of grade 3 AEs as 20% with ipilimumab and as much as 13% with pembrolizumab (Farolfi et al. 2012). For example, one debilitating event, hypophysitis, inflammation of the pituitary gland, has been mentioned to be reported in ipilimumab at a higher percentage than anti-PD-1 (Robert et al. 2015). Do biomarkers vary between these checkpoint therapies? The TCR Repertoire has been suggested as a potential immunotherapy predictor, yet most will argue that deciphering the patterns from this complex data set is a major challenge. Striking differences have been reported in patient TCR profiles from anti-CTLA4 versus anti-PDL1 therapy in melanoma. In patients treated with anti-CTLA4, greater peripheral TCR diversity before treatment was reportedly associated with a better response to ipilimumab (Postow et al. 2015). However, in patients treated with pembrolizumab, those with less diverse, more clonal T cell populations showed better efficacy (Tumeh et al. 2014). Recent investigation into the class I HLA type of >1500 advanced cancer patients showed that homozygosity at HLA loci was associated with reduced survival following immune checkpoint blockade by either anti-CTLA4 or anti-PD-1 (Chowell et al. 2017). Additionally, in patients treated with anti-CTLA4, they also found an HLA-B44 supertype that was associated with extended survival. Using peripheral blood samples from melanoma patients treated with either anti-CTLA4 or anti-PD1, investigators at Dana-Farber discovered distinct candidate biomarkers in responders and non-responders between treatments (Subrahmanyam et al. 2018). From CyTOF analysis, which uses metal ion tagged antibodies to detect cell lineages, they found that responders and non-responders to anti-PD- 1 differed in CD69+ and MIP1β+ NK cell populations. Yet, with anti-CTLA4 treatment, responders and non-responders differed between CD4+ and CD8+ memory T cells. Comparing and contrasting the intricacies of these treatments can help us propose a better strategy for combinations. Inhibiting both CTLA-4 and PD-1/PD-L1 could work synergistically together to induce T cells in the immune response. 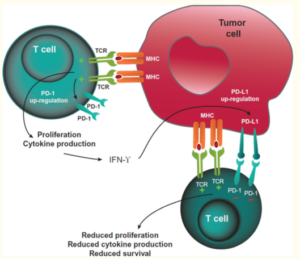 Each act in different times in the cancer-immunity cycle, as CTLA-4 works early on to activate T cells, while PD-L1 plays a role later on in the tumor microenvironment. Consequently, the combination of the two is quite logical. Indeed, the latest results presented at AACR and published in NEJM (Hellmann et al. 2018) revealed that the combination of Yervoy (anti-CTLA4) and Opdivo (anti-PD-1) had significant Progression Free Survival (PFS) compared to chemotherapy in NSCLC. This was shown by a 42.6% PFS rate with the immunotherapy combo compared to a 13.2% with chemo. 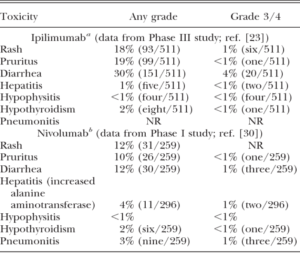 Data like these are validating the benefit and rationale of this combinatorial immunotherapy approach. Despite rapid advancements with these therapies, the patient population that benefits is still limited to 20%. An enhanced understanding of the resistance mechanisms and more meaningful predictive biomarkers will provide opportunities to further facilitate clinical decision-making for patients. As the pursuit for superior biomarkers continues with each individual therapy as well as with combinations thereof, high content assays and analytics such as the ACE ImmunogenomicsID and NeoantigenID provide a comprehensive profile for integrating complex data to shape immuno-oncology translational efforts. These advanced analytics deliver not only TMB and neoantigen load, but extend the investigation into antigen presentation machinery, DNA repair and replication, inflammatory signatures and cytotoxicity. Exploring tumor immunogenomics of patients who progressed on therapy or who exhibit innate resistance would help personalize these therapies, provide insight on possible more efficacious combinations, and utlimately expand immunotherapy benefits to a larger patient population.